A classic British combination of cherries and almonds, this is a great way of using fresh fruit when it’s in season. 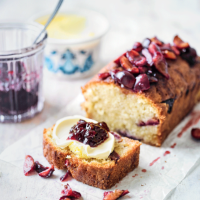 Try halving the cake and spreading it with cherry jam and clotted cream for an afternoon tea special. 1. Preheat the oven to 180°C, gas mark 4. Grease and base line a 900g loaf tin. 2. Whisk the butter and sugar until pale and fluffy, then whisk in the eggs, one at a time. 3. Mix together the flour, baking powder and ground almonds, and stir into the butter mixture. Spoon into the loaf tin and scatter over the marzipan and half the cherries. Bake for 45-50 minutes until a skewer, when inserted into the centre of the cake, comes out clean. Allow to cool before removing from the tin. 4. Meanwhile, place the remaining cherries and 1 tbsp sugar in a small saucepan, and cook gently for 1-2 minutes until the sugar has dissolved. Allow to cool. Spoon over the cake and serve.